The Barbary lion is considered a population of the African lion subspecies Panthera leo leo. This population is regionally extinct in North Africa. It inhabited the Atlas Mountains and was therefore also known as the Atlas lion. 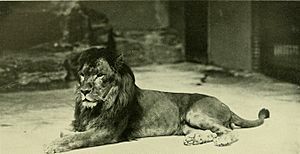 Alfred Edward Pease referred to the Barbary lion as the North African lion and claimed that the population had diminished since the mid-19th century, following the diffusion of firearms and bounties for shooting them. The last recorded shooting of a wild Barbary lion took place in Morocco, near Tizi n'Tichka in 1942. Small groups of lions may have survived in Algeria until the early 1960s, and in Morocco until the mid-1960s. Sultan the Barbary lion, New York Zoo, 1897. Besides 'black-maned' Cape lions, lions in Northwestern Africa had the "most luxuriant and extensive manes" amongst lions, with "tresses on flanks and abdomen,". Moreover, it appears that the only other lion which naturally had underbelly hair was the Mesopotamian lion. In contrast, Egyptian males appeared to have been maneless, like their Arabian and Syrian relatives. Before it became possible to investigate the genetic diversity of lion populations, the colour and size of lions' manes was thought to be a sufficiently distinct morphological characteristic to accord a subspecific status to populations. However, results of a long-term study of Masai lions in Serengeti National Park indicate that various factors, such as ambient temperature, nutrition and the level of testosterone, influence the colour and size of lion manes. Sub-Saharan African lions kept in cool environments of European and North American zoos usually develop bigger manes than their wild counterparts. Barbary lions may have developed long-haired manes because of temperatures in the Atlas Mountains that are much lower than in other African regions, particularly in winter. Therefore, the size of manes is not regarded as an appropriate evidence for identifying Barbary lions' ancestry. Instead, results of mitochondrial DNA research published in 2006 support the genetic distinctness of Barbary lions in a unique haplotype found in museum specimens that are believed to be of Barbary lion descent. The presence of this haplotype is considered a reliable molecular marker for the identification of Barbary lions surviving in captivity. The Barbary lion was long considered one of the biggest lion subspecies, or even the largest lion and African cat. Museum specimens of male Barbary lion were described as having very dark and long-haired manes that extended over the shoulder and to the belly. Head-to-tail length of stuffed males varies from 2.35 to 2.8 m (7 ft 9 in to 9 ft 2 in), and females measure around 2.5 m (8 ft 2 in). A 19th-century hunter described a large male allegedly measuring 3.25 m (10.7 ft) including a 75 cm (30 in) long tail. In some historic accounts the weight of wild males was indicated as very heavy and reaching 270 to 300 kilograms (600 to 660 lb). But the accuracy of the measurements may be questionable, and the sample size of captive Barbary lions were too small to conclude they were the biggest lion subspecies. 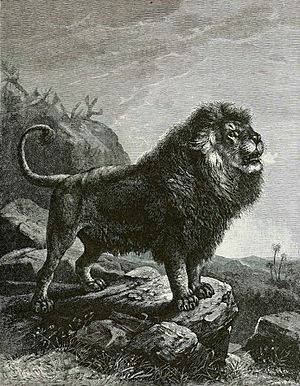 Nevertheless, Gettysburg Compiler (1899) described a lion called 'Atlas', from the Atlas Mountains between Algeria and Morocco, as being "much superior to the black-maned lions of South Africa in bulk and bravery." Pease accounted in 1913 that in areas where lions were not very numerous, they were more frequently found in pairs or family parties comprising a lion, lioness and one or two cubs. He several times came across two old lions and a lioness living and hunting together. Observations of wild Barbary lions made between 1839 and 1942 involved solitary animals, pairs and family units. Analysis of these historical records suggests that Barbary lions retained living in prides even when under increasing persecution during the last decades, especially in the eastern Maghreb. 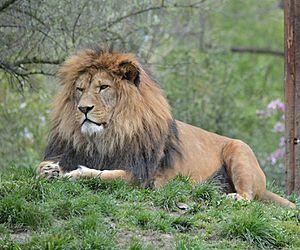 The size of prides was likely similar to prides living in sub-Saharan habitats, whereas the density of the Barbary lion population is considered to have been lower than in moister habitats. When Barbary stags and gazelles became scarce in the Atlas Mountains, lions preyed on herds of livestock that were rather carefully tended. They also preyed on wild boar and red deer. Sympatric predators included the African leopard and brown bear. Illustration by Joseph Bassett Holder. The Romans used Barbary lions in the Colosseum to battle with gladiators. Barbary lions inhabited the range countries of the Atlas Mountains including the Barbary Coast. Jardine remarked in 1834 that at the time lions may have already been eliminated from the coastlines, marking the border to human settlements. In Algeria, they lived in the forest-clad hills and mountains between Ouarsenis in the west, the Pic de Taza in the east, and the plains of the Chelif River in the north. There were also many lions among the forests and wooded hills of the Constantine Province eastwards into Tunisia and south into the Aurès Mountains. By the middle of the 19th century, their numbers had been greatly diminished. The cedar forests of Chelia and neighbouring mountains harboured lions until about 1884. The last survivors in Tunisia were extirpated by 1890. In the 1970s, Barbary lions were assumed to have been extirpated in the wild in the early 20th century. 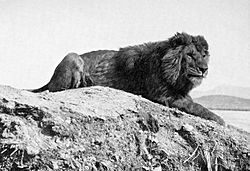 However, a comprehensive review of hunting and sighting records indicates that a lion was shot in the Moroccan part of the Atlas Mountains in 1942. Additionally, lions were sighted in Morocco and Algeria into the 1950s, and small remnant populations may have survived into the early 1960s, in remote areas. Young male in New York Zoo, 1903. This male in Plzeň Zoo is allegedly a Barbary lion. Historically, Barbary lions were offered in lieu of taxes and as gifts to royal families of Morocco and Ethiopia. The rulers of Morocco kept these 'royal lions' through war and insurrection, splitting the collection between zoos when the royal family went briefly into exile. After a respiratory disease nearly wiped out the royal lions in the late 1960s, the current ruler established enclosures in Temara near Rabat, Morocco, to house the lions and improve their quality of life. There are currently a small number of 'royal lions' that have the pedigree and physical characteristics to be considered as mostly pure Barbary descendants. Some were returned to the palace when the exiled ruler returned to the throne. In the 19th century and the early 20th century, Barbary lions were often kept in hotels and circus menageries. The lions in the Tower of London were transferred to more humane conditions at the London Zoo in 1835 on the orders of the Duke of Wellington. 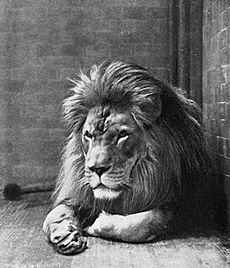 One famous Barbary lion named "Sultan" was kept in the London Zoo in 1896. Emperor Haile Selassie I of Ethiopia had a collection of lions at Addis Abeba's zoo. They looked like Barbary or Cape lions, because of their dark, brown manes that extended over the chest through the front legs. In 2011, the Port Lympne Animal Park in Kent received a Barbary lioness as a mate for the resident male. More recently a number of researchers and zoos have supported the development of a studbook of lions directly descended from the King of Morocco's collection. This work has been conducted on the precautionary principle that this subpopulation of animals may hold unique Barbary lion genes as well as demonstrating the morphology of the ancestral Barbary lion. As of June 2016, Wisconsin Big Cat Rescue in Rock Springs, Wisconsin, has two female lions born in 2001 that have been shown by DNA testing to be Atlas lions. The Living Treasures Wild Animal Park in New Castle, Pennsylvania, claims to keep a pair of Barbary lions in the park's collection. The Zoo des Sables d'Olonne, Vendee, France, also claims to have a male and female Atlas lion. Barbary lions from Mauritania and Numidia were used in Roman Gladiatorial games. Omar Mukhtar the Libyan revolutionary was called the "Asad aṣ-Ṣaḥrā’" (Arabic: أَسَـد الـصَّـحْـرَاء, "Lion of the Desert"). 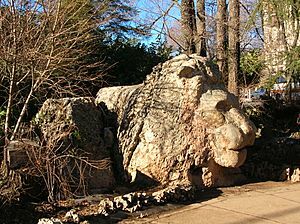 A lion's sculpture by Henri Jean Moreau in 1930, in Ifrane, Morocco. 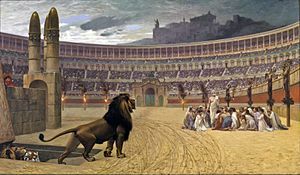 Persecution of Christians in the Roman Empire, using the lion and tiger. Painting by Jean-Léon Gérôme, commissioned by William Thompson Walters in 1863. Barbary lion Facts for Kids. Kiddle Encyclopedia.